Dogsbutter, recalled with other Sunland Inc manufactured peanut buttersIf you're a peanut butter fan, I'm sure you've paid attention to the recent Sunland, Inc. voluntary recalls of various brands of peanut butter manufactured by the company due to salmonella bacteria being identified in some samples. 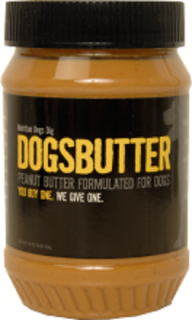 Today, a very new item for dogs, Dogsbutter, also joined the list of recalls, sad news for our dogs, the Dog For Dog company that owns the brand, and all the shelter dogs who will not receive their donations of the Dog For Dog goodies. Dog For Dog only recently opened its shop, online at DogForDog.com. Its inspiration was a desire to provide something healthy and tasty dogs, peanut butter made especially for them, and a desire to give to needy dogs, dogs who seldom get treats - those who live in the nation's animal shelters. The Dog For Dog name means that for every product purchased, the same product will be donated to a needy dog in a shelter. It should be noted that no dogs (or humans) have been reported as being sick as a result of eating Dogsbutter, and that no salmonella bacteria has been found in the Dogsbutter samples tested. Sunland Inc. does manufacture its Dogsbutter, however. “While NO DOGSBUTTER products have tested positive for Salmonella, our number one focus is ensuring the health, safety and well-being of Dogs. While the FDA, CDC and State agencies investigate the cause of reported illness, we are taking voluntary steps to ensure the safety of our four legged family members. We have worked closely in developing DOGSBUTTER and produce it in only the highest quality, human grade facilities with quality testing to ensure quality for pets. When there is a question, we want to be proactive and protective of the families who trust in our brand and love their pets as much as we do. If you have purchased one of these products, please dispose of it, or return it to your local retail pet center for a full refund. Retailers should return the DOGSBUTTER to the distributor for a full credit”. The Dogsbutter recall is limited to jars manufactured May 1, 2012 through September 24, 2012. For other Sunland Inc products affected by the recall, visit the FDA for its latest update. Has Reality TV Gone To The Dogs?